It’s been a long time since I could say something good about anything that Adam Sandler has done. The comedian used to be one of my favorite Saturday Night Live actors as a kid, but his schtick quickly grew staler than anything the Lunchlady cooked up. I was always his biggest critic, hating on nearly everything he released. I longed for the days he was on SNL and was releasing hilarious comedy albums, but sadly, after signing with Netflix, his films got even worse. However, I’m happy to report, the comedian’s latest stand-up effort, “100% Fresh,” has breathed some new life into his fledgling career. Sandler not only hits all the right notes with his songs, but he tells some pretty funny jokes in the special. Sandler’s specials rival those of Dave Chappelle for funniest to date on Netflix. For Sandler, it’s the first time since the 2009 film “Funny People” that I have enjoyed his work. With Judd Apatow’s film, we saw a side of Sandler that we rarely had the chance to see. It was almost if the comedian was being human and normal in the film. He was being himself. Having never been a fan of “Billy Madison,” I felt like the actor was always trying to replicate the irritating character that many had grown to love. In “Funny People” and in his new stand-up special, Sandler drops that persona and is just himself and the result is pure gold. Songs such as “Phone, Wallet, Keys” and “Uber Driver” are hilarious and instantly memorable. Sandler’s performance of “Farley,” his tribute song to the late, great Chris Farley will make you laugh and cry at the same time, something that only the greats can do. Make no doubt about it, The Sand Man, as he calls himself in the 74-minute special is back. I for one hope that Sandler does more of these comedy specials and less of the juvenile movies, after all, the comedian is 52 going on 12. 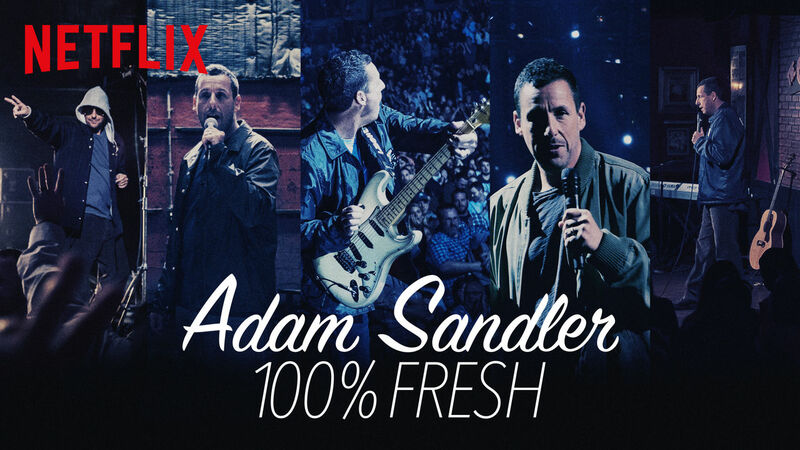 Adam Sandler’s 100% Fresh gets an A-.